Here is a wonderful kinetic mobile created for Festo, a company that specializes in automation. It is a helium filled flying object that turns itself inside out. This is a constant and rhytmic motion called inversion. Here is a short stop action video posted by Daniel Wall showing the shapes and how this motion is achieved. It includes a dodecahedron followed by the simpiler Schatz cube which was named after mathemetician Paul Schatz. 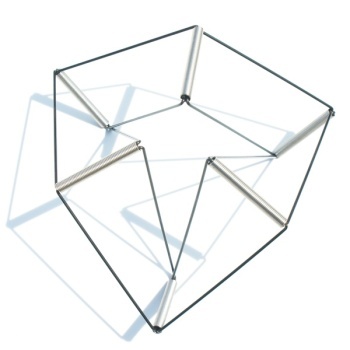 We have several widgets in our collection that were derived from this concept including a hexyflex wire model. I'd love to see the helium version in motion but I can't find any reference as to where this sculpture is located. Anyone know? Newer PostSolo Kinetic Sculpture takes flight!